José Maya performs his newest work Latente: A Flamenco Journey, in its New York debut, a journey that takes the audience to the deepest realms of a Gypsy flamenco dancer’s soul. Choreographed by José Maya, this program follows him on a quest of self-discovery while an ancestral spirit guides him in this search to freedom and understanding. Maya will be joined by legendary Gypsy singer Juana la del Pipa, powerhouse vocalists Enrique el Extremeño and Manuel Tañé, and celebrated guitarist Pino Losada. José Maya was born in 1983 to a Gypsy family of intellectuals: artists, painters, actors and writers including dancer Fernanda Romero, painter Antonio Maya and the singer Gabriel Moreno. He began his dance career at the young age of 9, sharing the stage with artists like Antonio Canales, Juan Ramírez, Joaquín Grilo and Enrique Morente. 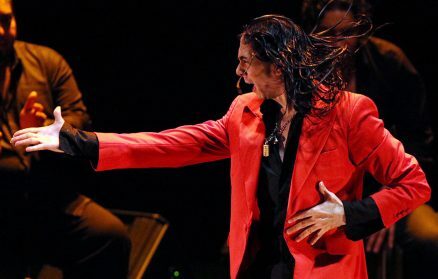 He was won many prestigious dance awards and has performed all over the world with many of Flamenco’s biggest stars. Juana la del Pipa is a powerhouse Gypsy singer from Jerez de la Frontera. Juana has performed around the world and with her nephew Antonio El Pipa and she is featured on several cds, including Los Juncales de Jerez (1998) and Mujerez (2009). Enrique El Extremeño (Juan Antonio Santiago Salazar) Born in the Gypsy community of Zafra (Badajoz) in 1954, he grew up in Andalucía (Huelva) and later moved to Madrid where he began singing publically at age 15. He is widely acknowledged as the world’s strongest and most versatile singer for Gypsy flamenco dance. He has accompanied such luminaries as Farruco, Mario Maya, El Güito, Manuela Carrasco, Cristina Hoyos, El Mistela, Antonio el Pipa, Eva Yerbabuena, Matilde Coral and Enrique el Cojo, among others. He has issued 7 records as a soloist and has received important awards such as the “Giraldillo de Cante” (2004 Bienal de Arte Flamenco de Sevilla). Manuel Tañé, born in Jerez de la Frontera, started performing at the age of 16, and has gained national and international acclaim from his performances in theaters worldwide. Tañé has accompanied the baile of Manuela Carpio, Concha Vargas, and many others. Pino Losada (Diego Fernández Montoya) Pino Losada was born into a family of Gypsy Flamenco artists in Madrid, Spain. He began playing guitar in public when he was only 15 years old with his uncle, Tito Losada and alongside greats as “El Indio Gitano” and Juan Andrés Maya. He has become known for his skills in accompanying the dance working with luminaries such as Joaquín Cortés and Sara Baras, among others. He has also recorded with singers Ramón “El Portugués” and “Guadiana”.